This pendant of gold and lapis lazuli is part of “The Treasure of Ur”, although the name is somewhat misleading. Ur is a Sumerian city, but the Treasure of Ur was found in Mari, which is an Akkadian city. The pendant was found in a sealed clay jar buried under a Pre-Sargonic palace of the Early Dynasty III period (ED III). The jar contained more than a hundred items, including jewelry, cylinder seals, and statuettes. Most of the objects, like the Anzud pendant, were Sumerian, but other items were manufactured in different parts of Mesopotamia. One of the most important pieces of treasure is an elongated bead inscribed with the name of Mesanepada, the king of Ur, founder of the First Dynasty of Ur. His father was Meskalamdug. Both men were Kings of Kish, the traditional title given to any king who ruled all of Sumer and Akkad. 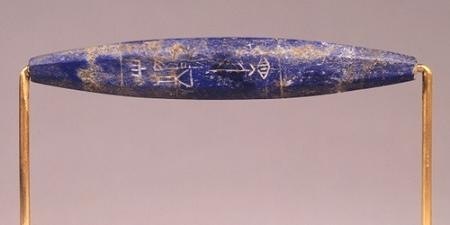 Lapis lazuli bead from the Treasure of Ur, discovered by André Parrot in 1965.
due to damage. The part of the inscription shown above translates as “the king of Ur”. was it found in a jar buried beneath an Akkadian palace in faraway Mari? Several theories have been offered. First, the Treasure of Ur was meant to be a gift from the king of Mari to the king of Ur, or vice versa. However, it seems unlikely that the treasure is a gift that was placed in a jar but not sent by the king of Mari, or a gift that was delivered to him but not opened. Besides, where is the “gift tag”? 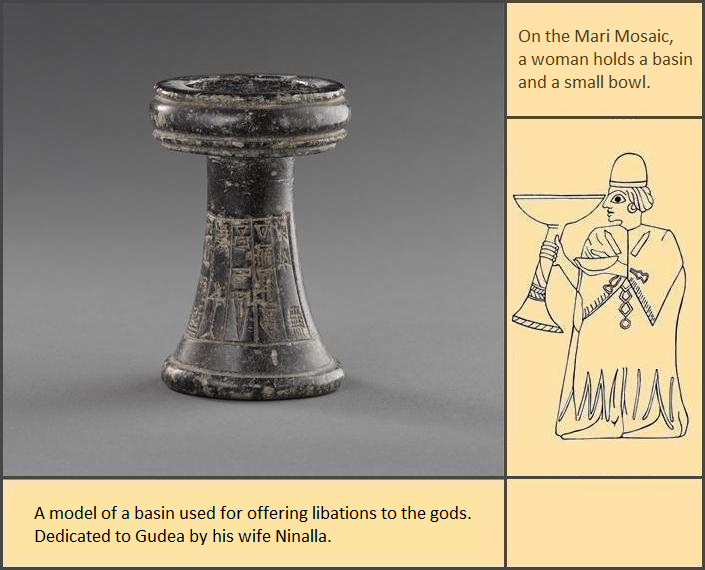 The jar should have been inscribed with the names of the kings (“from the king of Mari, to the king of Ur”). Another theory suggests it's a votive offering placed in a cultic room in the palace. Yet another theory proposes that it is “plunder and booty” taken in some regional war. The usual explanation for buried wealth is that it’s a “secret stash”. The owner buried it for safekeeping, perhaps in times of war, and he died (or was killed) before he could retrieve the treasure. The problem is that none of these theories answer the central question of how the Mesanepada bead got there in the first place. I've got a theory, which I will later explain. The Mesanepada bead highlights a major problem with archaeology in Mesopotamia; i.e., the "find spot" of an artifact doesn't necessarily indicate its country of origin. Just because an artifact is found in a given location doesn't mean it was made there. It could have been made somewhere else. This is especially true of Sumer and Akkad, and particularly true of Mari. Sumer and Akkad were neighboring countries that shared a long history together. They were trading partners so there was an extensive exchange of manufactured goods between them. There were also social interactions among the citizens, especially in the ruling class, who created powerful alliances by making strategic marriages. 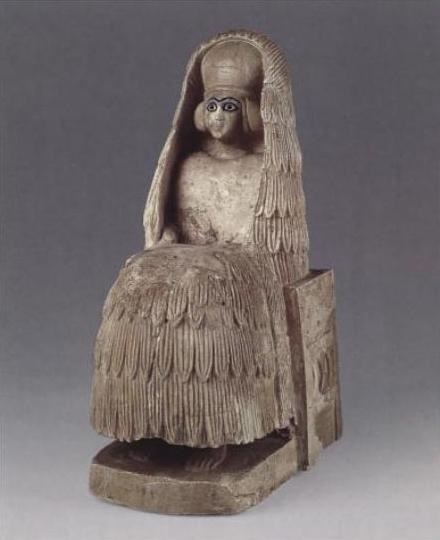 Queen Pu-abi, who is buried in the Royal Tombs of Ur, is believed to be Akkadian. Besides social and commercial interests, there was also a lot of official business conducted between Sumer and Akkad. Although they were two separate and distinct countries, they were often governed by the same man, the King of Kish, the ruler of Sumer and Akkad. Sometimes he was a Sumerian and sometimes he was an Akkadian. So it’s not surprising that Sumerian cylinder seals were found in Akkad, and Akkadian cylinder seals were found in the Royal Tombs of Ur. More important for the purpose of this discussion, the Sumerians and Akkadians were often at war with each other, so there was a lot of plunder and booty moving back and forth across the borders. I often do image searches on the Internet, looking for pictures that I can use on this website. 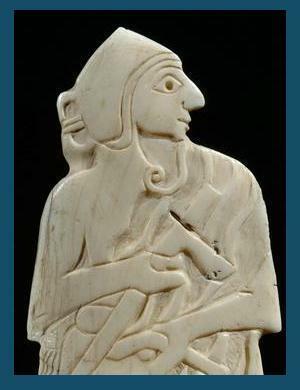 I don’t know how many times I’ve clicked on a picture of a "Sumerian" artifact, only to discover that it's from the city of Mari. It happened a lot. 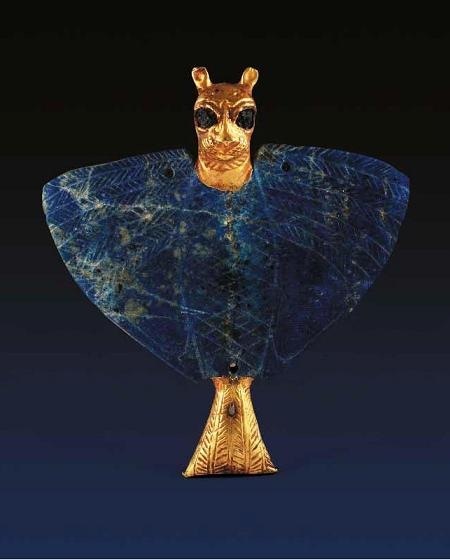 Why do so many Mari artifacts look Sumerian? 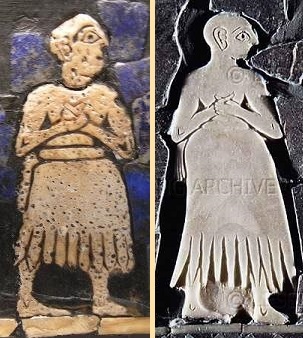 They resemble Sumerian artifacts in terms of subject matter and clothing styles and they’re rendered in the same artistic manner. They are so similar that Mari is mistakenly described as the "farthest outpost of Sumerian civilization" even though it is an Akkadian city. It's as if Sumer and Mari were in parallel universes. This is surprising because Mari was as far from Sumer as you could get and still be in Mesopotamia. In between Sumer and Mari was the entire Akkadian nation. 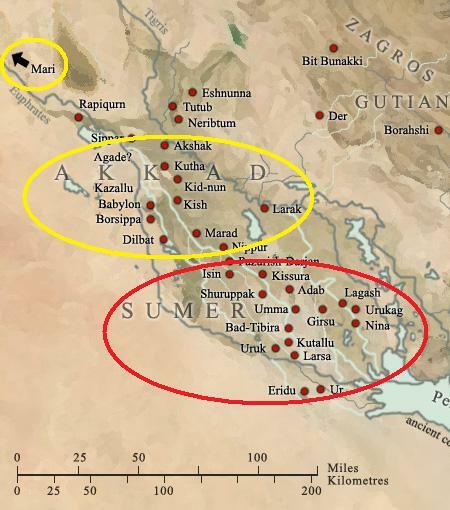 A map of Mesopotamia showing Mari in relation to Sumer. 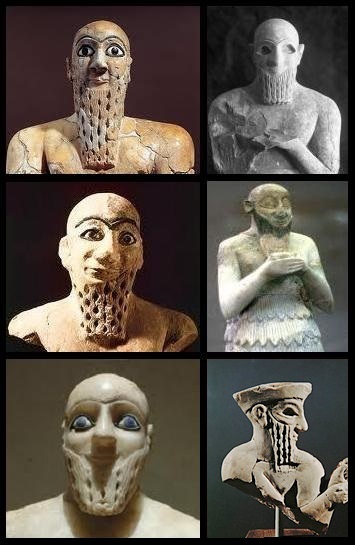 I began to suspect that “plunder and booty” might explain why so many ED III artifacts from Mari look Sumerian. Let’s take a look at some Mari artifacts to determine if they are Sumerian or Akkadian. a king. He is a Sumerian King of Kish, possibly Eannatum, the ruler of Sumer and Akkad. He is in full regalia, with some accoutrements that are Sumerian and some that are Akkadian. There is an important political reason for this, as will later be explained. 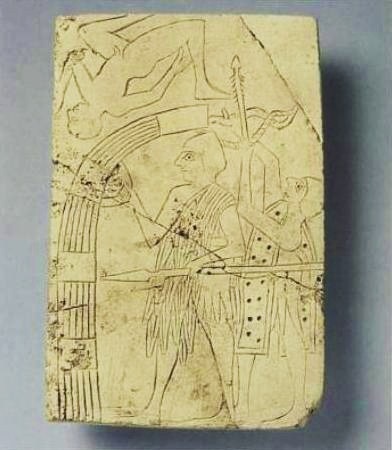 Limestone plaque found in the palace of Mari: This is a very important artifact because it is the first depiction of siege warfare in the ancient world. On the left, a soldier stands behind (and beneath) a large curved shield made of bundled reeds. The shield is very cumbersome and it would be completely impractical on an open battlefield where rapid mobility is required. Instead, the shield is designed for siege warfare, for battles fought at the base of a city wall. The curved top protects the soldier from missiles being thrown down by the defenders on the top of the wall. Beside the soldier is an archer shooting a flaming arrow. 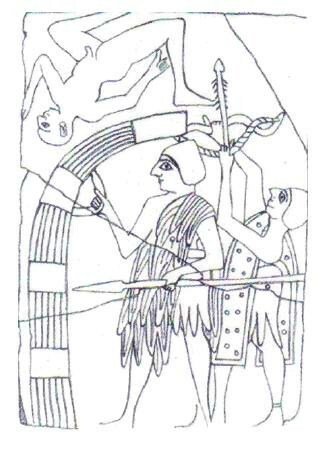 This is one of the earliest depictions of a bow and arrow being used in combat. Moreover, it is a “recurved bow”, with tips that curve away from the archer when the bow is strung, which gives the arrow greater speed and power. Flaming arrows were not used against infantry formations, instead they were used to set buildings on fire. Notice how the archer is shooting the arrow straight up, in order to clear the city wall. Meanwhile the body of an enemy defender (who is portrayed naked to show he is dead) tumbles down from the top of the wall. Taken all together, it is quite a dynamic scene. I suggest that these men are not the soldiers of Mari. They are Sumerian. 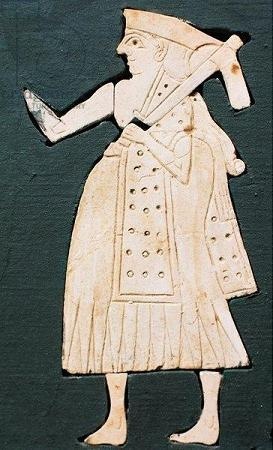 The skirt and the shoulder armor exactly matches those worn by Sumerian soldiers on the Standard of Ur. 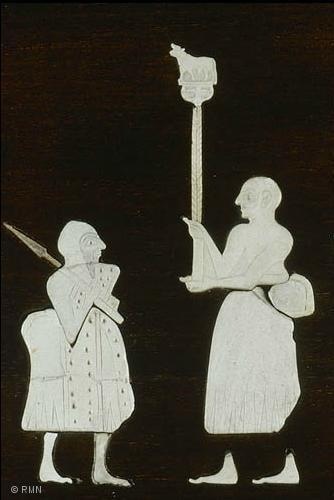 The shoulder armor is worn only by the nobility, so the soldier shown on the left is a lord, possibly a king. The archer on the right is a commoner. He wears a spotted garment like the common soldiers in the phalanx formation on the Standard of Ur. Throughout history, the archers were always commoners. That’s because they fought from a distance, which was considered to be somewhat cowardly. They were quite unlike the noble lords, full of bravado, who fought in heroic battles of individual combat, up close and personal. On the Standard of Ur, the king wears the distinctive shoulder armor. He has just defeated the Akkadian king in individual combat. The common soldier wears a spotted cloak. The uniforms of each city-state had unique markings to make the soldiers easy to identify on the battlefield. So the world’s first depiction of siege warfare is definitely Sumerian. Which raises another interesting question: Why would a plaque showing a Sumerian victory be displayed in the palace of Mari? More about that later. Many mosaics were discovered in various temples at Mari. The mosaics were in pieces scattered on the floor, so their reconstruction is somewhat speculative. The Louvre suggests they were decorations on gaming boards and musical instruments. I would suggest, however, that this is unlikely. The mosaics depict solemn religious rites and scenes of battle. They would not be used as mere decorations on something as frivolous as a board game or a musical instrument. stab the chariot driver in the back. The upper half of his body doesn’t match the lower half. He has a braid on the side of his head, a hairstyle typical of foreign barbarians. In addition, the legs of the chariot horses aren’t really legs, the reign posts are wrong, and so on. What’s important is the chariot itself. I would suggest that the chariot is Sumerian, not Akkadian. It has the same double-curve top and crossed diagonals as the chariots on the Standard of Ur and on Eannatum’s victory stele. 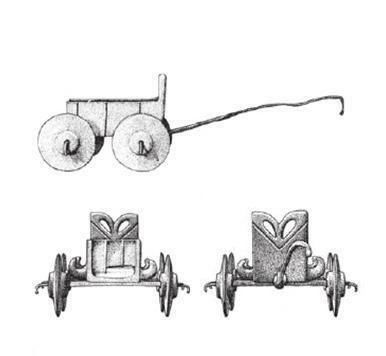 The chariots of each city-state had different markings to make them easy to recognize on the battlefield. 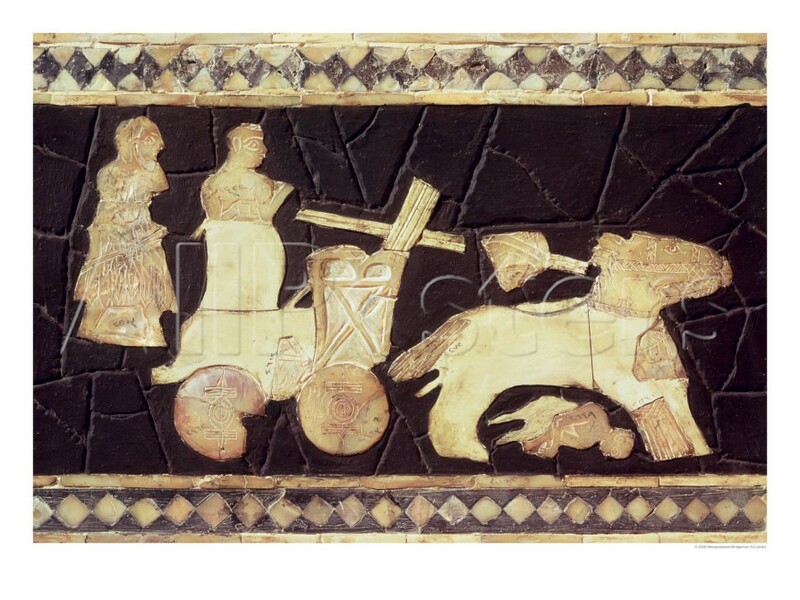 See an example of a different design on the front shield of another chariot. The king’s chariot on the Standard of Ur. 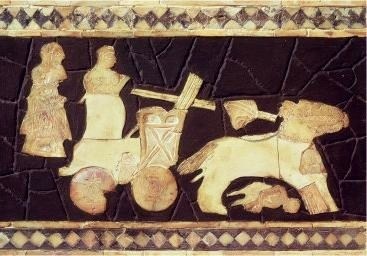 the same skirts, the same shoulder armor and helmets, and driving the same chariots. It's not just the soldiers of Mari who seem to dress like the Sumerians, the same is also true for the civilians. The men walk in a solemn procession. One of the men has his hands folded in prayer. 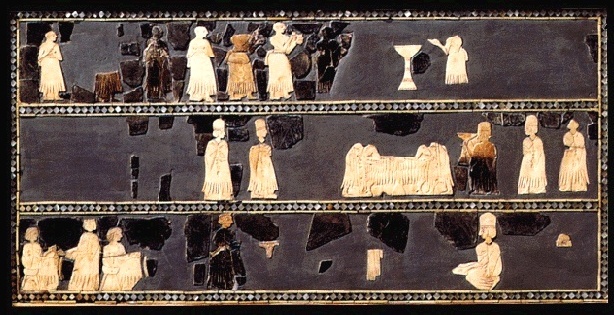 On the upper left, a high priestess holds an offering basin that was used in temples. She wears a large domed hat called a polos. The mosaic is all about Sumerian queens. See The Sumerian Queens on this website. 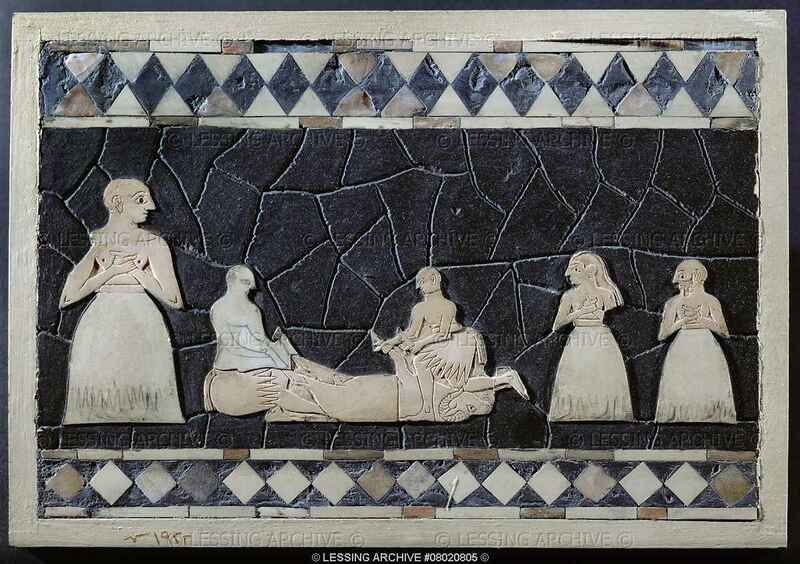 There is nothing particularly Akkadian about the Mari Mosaic. It is completely Sumerian. 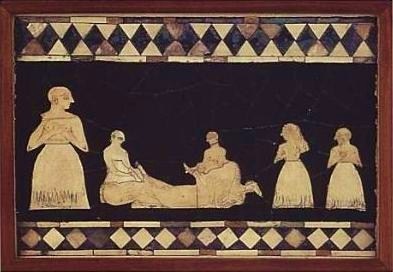 All of the women on the mosaic wear the typical Sumerian skirt with a broad leafy fringe. distinctive “angled-skirt” throughout most of their history. 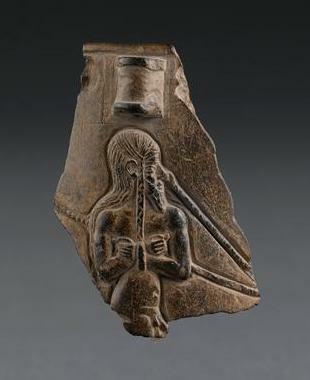 A Sumerian with his hands folded in prayer. He wears the traditional Sumerian skirt. 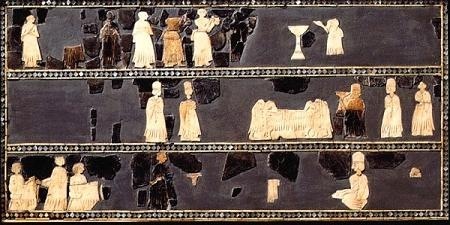 Detail from the Standard of Ur. See a comparison of him and the man on the Mari mosaic. 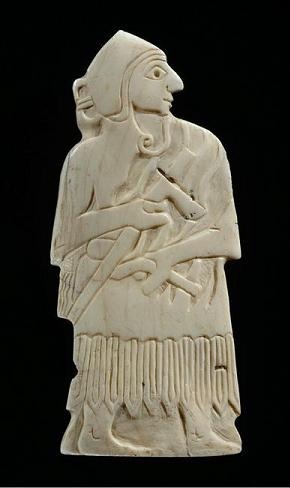 An ED III Akkadian on the peace side of the Standard of Ur. His skirt is short, split in front, and angled up in the middle. so of course they wore different national costumes. There were times, however, under very specific circumstances, when they actually did wear the same kind of clothing. This brings us to one of the most interesting of the Mari artifacts (and also the most confusing). The figure in the middle of the top register is the king, drawn larger than the other men to signify his greater importance. He holds a battle ensign featuring a bull statuette. The king’s soldiers are lined up behind him, and in front of him are more soldiers and a few prisoners. 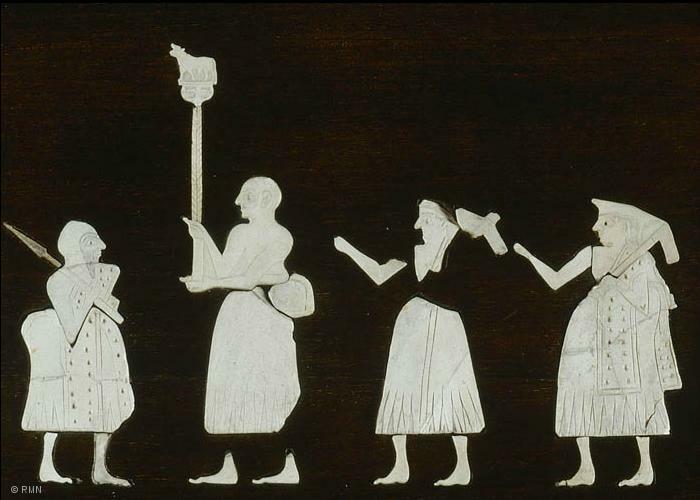 The bottom register is a confusing array of soldiers, prisoners, a chariot, and a clay pot (!?). The standard was found in the temple of Ishtar, in pieces scattered on the floor, which would account for the arbitrary arrangement of the figures. Below is shown a different arrangement, with each soldier escorting a bound prisoner (like on the Standard of Ur) which would explain why the soldiers have their arms hanging in the air. King on the Standard of Mari. He has a shaven face and head. 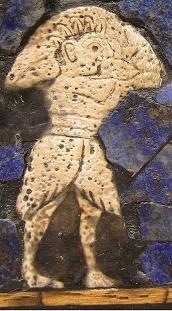 This is how Sumerian kings were usually portrayed, like on the Standard of Ur. The kings of Mari always have beards. Soldiers on the Standard of Mari. They wear Sumerian skirts and helmets. The sashes are Akkadian. they are Sumerians. The other two soldiers have beards, but no mustaches. 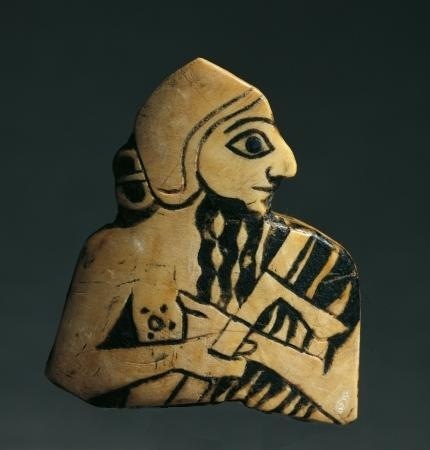 The Sumerians were sometimes shown bearded, but with the usual combination of beard and mustache. A beard without a mustache is a distinctive feature of Mariote men, so the bearded soldiers are men from Mari. 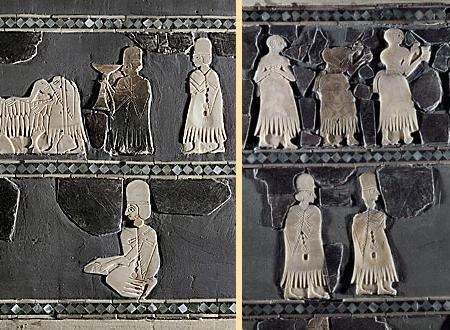 Notice the Akkadian hat worn by the man on the lower right. Also notice how the profile of the beard matches the profiles of the bearded soldiers in the above drawing. 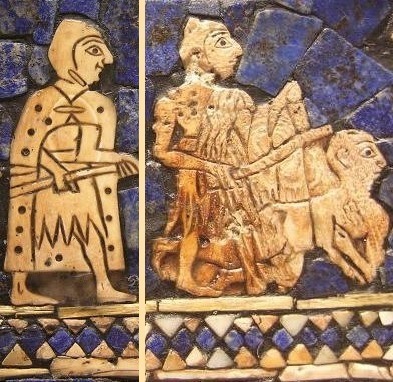 On the standard, we have soldiers from Sumer and Mari in the same army and wearing uniforms that are a blend of Sumerian and Akkadian styles. This is surprising because Sumerian and Mariote soldiers were not accustomed to fighting in the same army. They usually fought against each other. So why are they shown as allies on the Standard of Mari? There’s really only one good answer to the question: It’s because this is the coalition army of the King of Kish, the king of kings, the ruler of Sumer and Akkad. 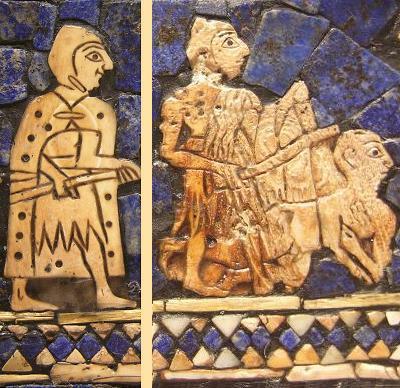 Although the Sumerians and Akkadians often battled each other, they never fought wars of extermination. They never tried to destroy each other or to enslave the opposing populations. Instead, the losing side simply became a vassal state of the winning side. In their long history together, sometimes the Akkadians ruled the Sumerians and sometimes it was the other way around. It’s difficult to keep track of how many times this happened. In any case, whenever a Sumerian king defeated his Akkadian enemies to thus become the King of Kish, he would portray himself as the legitimate ruler of both nations, and his former enemies would then be portrayed as his loyal subjects (whether they liked it or not). This is the personal seal of Mesanepada, whose votive bead is mentioned above. Part of the inscription reads, “Mesanepada, the King of Kish”. 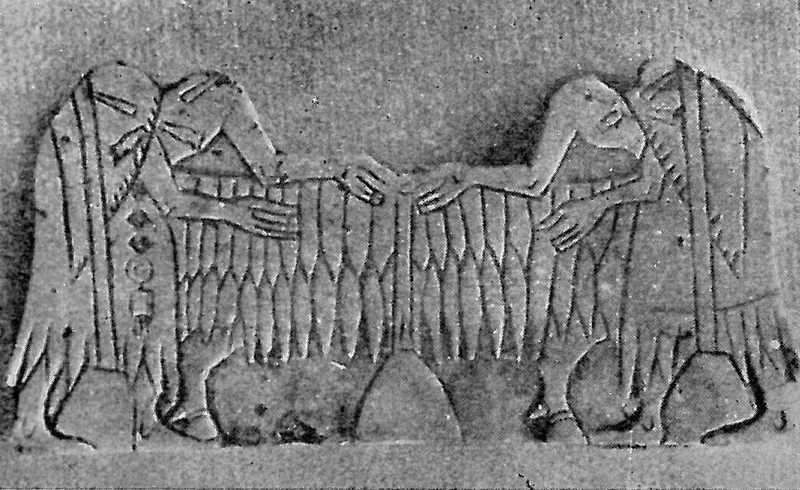 It shows a Sumerian and an Akkadian involved in a struggle together rather than against each other. On the left is an Akkadian king with a Mariote beard and wearing a spiky headdress who stabs the lion that is attacking the Sumerian hero. 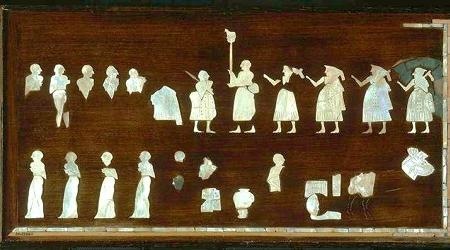 Part of the victory procession on the Standard of Ur. The men seem to be bringing gifts to “celebrate” the victory of the Sumerian king. Ever since the Standard of Ur was discovered 85 years ago, these men were thought to be the friends and allies of the Sumerians. They are actually the defeated enemy, and they are Akkadians (see Standard of Ur: King). Ironically, this had been the purpose of the scene all along – that former enemies now appear as allies, the loyal subjects of the Sumerian King of Kish. In this regard, the Standard of Ur and the Standard of Mari both serve the same purpose. 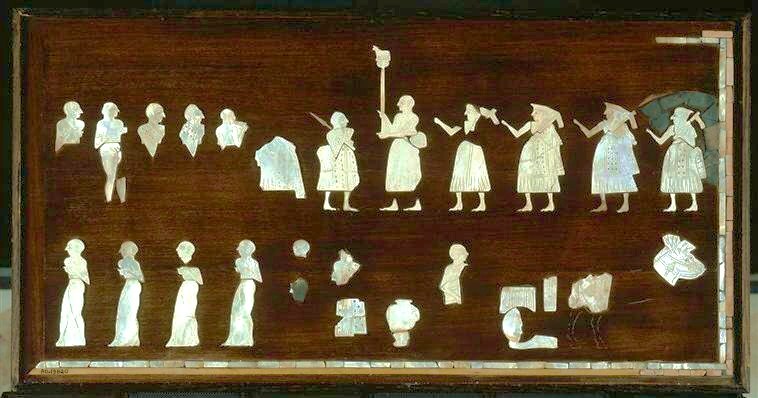 It's very possible that the Standard of Mari is not just a decorative mosaic panel, as is commonly supposed, but an actual royal standard like Standard of Ur, the kind carried aloft during processions of the king (see What is the Standard of Ur?). Mosaic panel from the temple of Shamash in Mari. 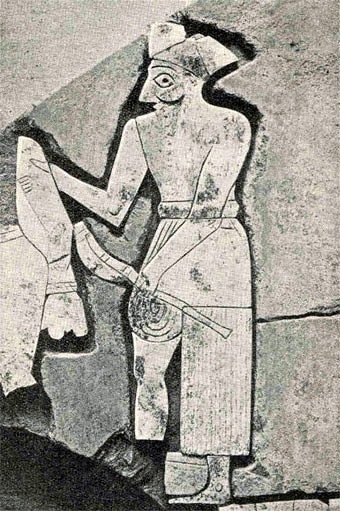 A Sumerian king (shown larger than the others to indicate his greater importance) presides over the ceremonial sacrifice of a ram. 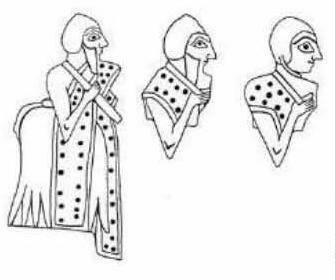 An enlargement shows that the ceremony is attended by a long-haired Sumerian priest (second from the right) like the one shown on the Standard of Ur. Also in attendance is a bearded man of Mari (far right). If the king were also a Mariote, he would have the same Mariote beard (without a mustache), just like Lamgi-Mari and all other ED III kings of Mari. As previously stated, many of the Mari mosaics were found scattered on the floors of various temples. André Parrot, who discovered most of the mosaics displayed on this page, reports that it seemed as if they were part of the rubble that was used to backfill the foundation of an old temple in order to build a new temple on top of it. These mosaics were expensive works of art, laborious to produce, and often constructed of precious materials. They depict solemn religious ceremonies and glorious victories in war, so why were they destroyed and then thrown into a landfill? I would suggest that the temples and the palace were either built by the Sumerian invaders or temporarily occupied by them. The mosaics were the Sumerians' votive offerings to the Sumerian/Mariote gods (they had many gods in common). After the Sumerians had been run out of town, the temples were cleansed of their presence, or new temples were built on top of the old ones. In this way, the Sumerian temple of Inanna would be re-consecrated as the temple of the Akkadian goddess Ishtar. These mosaics weren't valuable to the Mariotes. 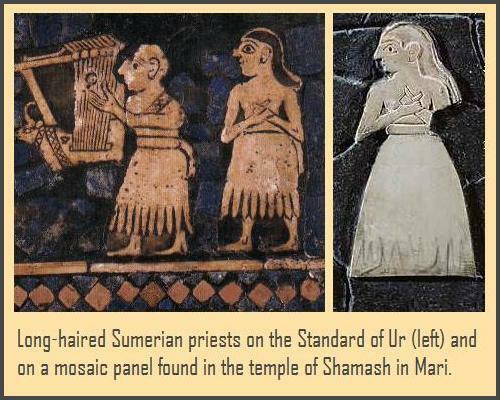 The people of Mari were happy to be rid of the mosaics, which were reminders of the Sumerian occupation, and they were happy to finally be rid of their Sumerian overlords. The ED III artifacts found in Mari are not "plunder and booty" that was stolen from the Sumerians. 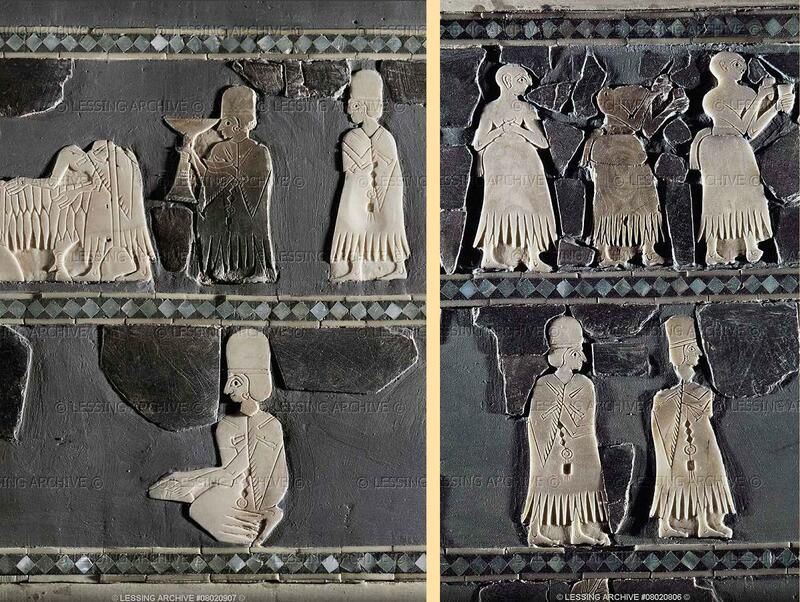 These works of art were placed in the temples by the Sumerians themselves. After the Sumerians were expelled from the city, their votive offerings were either destroyed or transferred to the palace as trophies of war. That is why the votive bead of Mesanepada ended up in the palace of Mari. The same is true for all the other Sumer artifacts found at the palace and in the temples. This brings us back to the figure of the Sumerian King of Kish. I had previously identified him as Eannatum, but in light of the evidence I must concede the possibility that he is perhaps Mesanepada, because his bead and this inlay were both found in the palace. He was one of three Sumerian Kings of Kish during this period of history (2500 – 2400 B.C), including his father Meskalamdug and also Eannatum, so the inlay could depict any one of the three men. 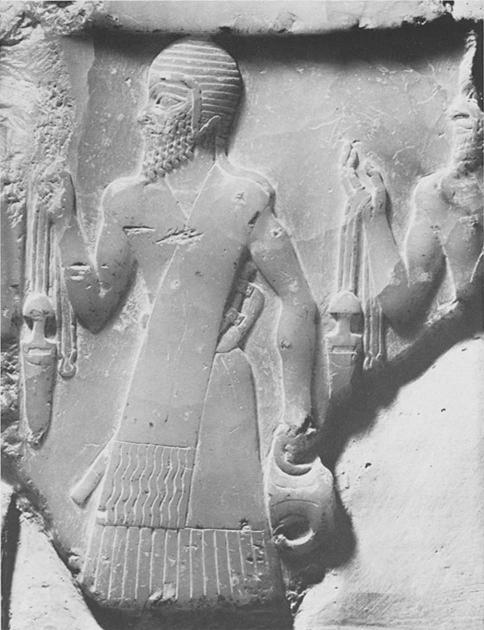 depict how a Sumerian King of Kish portrayed himself to his subjects in Mari.